As I mentioned in my introductory post, I love (new) Pyrex with seal-able lids because they don’t spill in my lunch bag and they are glass, which I prefer to plastic containers for re-heating. My love for Pyrex can be described by taking a look in my cabinet, fridge or freezer or by knowing that I post deals on Facebook profile. This past year, I gave Pyrex as gifts to friends who were disappointed to have missed out on a steal of a deal I posted. I even went so far as to give a Pyrex rectangular in a gift exchange along with a recipe, of course. I did not attend any weddings or showers, but if I did you can guess what the gift would have been! To the untrained lunch packer and planner, it may appear that I have too much Pyrex , but as someone who makes a meal like Baked Spaghetti and then portions them out (that’s my idea of a pre-packaged meal) I have an appropriate working amount. I like the 1-cup round for side items like fruits and vegetables and the 2- and 4-cup rounds for entrees. The large rounds are good for soup or stew storage while the rectangle are perfect for baking casseroles. Yes, I even have Pyrex Portable Double Decker – I love it for potluck parties! This post features Pyrex from my own collection. I did not receive compensation or complimentary product from Pyrex. I’m just a fan. Oh Where, Oh Where are you my Tupperware? How often do the deals come out? You’re making me HATE my plastic, so I need to get me some of these! Oh, and I didn’t realize you were talking about *this* kind of Pyrex. I was thinking glass lids, you know like back in the day – but maybe that is corning ware? I imagine we grew up in similar households with Pyrex and Corning and their glass lids. Now both have plastic lids (that I do not microwave). I believe my sister has some Corning white with lids, but we both like these clear Pyrex because you can see the contents. I haven’t seen any deals lately, but I watch amazon, target and walmart and will post any I see. I would like to find some lids for Corelle bowls. I wonder if they make them. pyrex is the greatest thing to happen to leftovers since… leftovers. I love my Pyrex with the lids! My mom bought me several for Christmas a couple years ago, and they were the best gift ever. What I love most is that I can put things in them that would leave stains or smells in plastic storage containers. I actually have tofu in a marinade with stinky garlic and onions for dinner in one as we speak! You bring up a good point I forgot – no stains or stink with these! 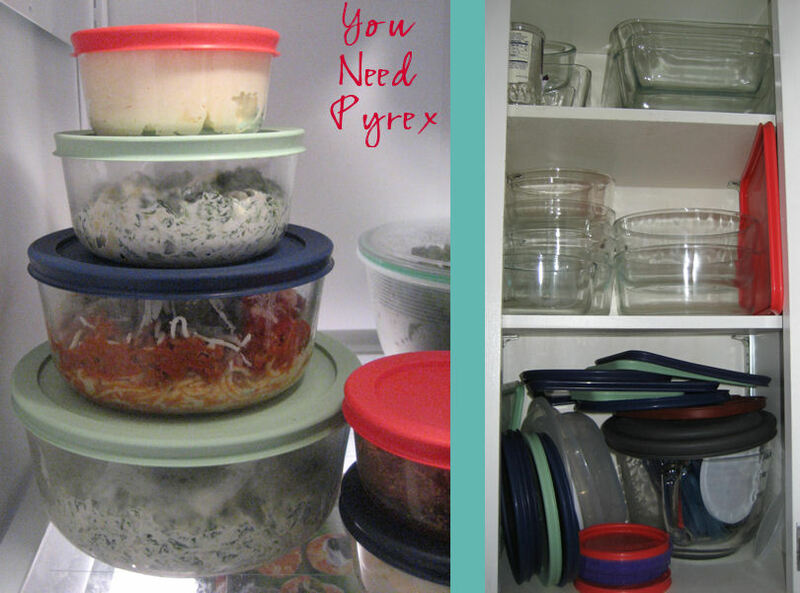 I am so with you on the glass/Pyrex containers! Except — the lids on my set wore out really quickly — they got cracks on the sides (even though it’s flexible plastic) and somehow stretched a bit, so that I have to put a big rubber band around the container to keep the lid on. Putting one in the microwave was death — it distorted within seconds. If I could buy extra lids, I’d ditch the plastic containers entirely.